Ready for a Smile Makeover? Your Cosmetic Dentist Can Help! How do you feel when you smile at yourself in the mirror? Are you ready to take on the world with your charming personality and dazzling good looks, or do you cringe at your reflection because your teeth aren’t as perfect as you wish? If your pearly whites aren’t so white, or if you have cracks, chips, or gaps in your smile, you don’t have to suffer with those flaws forever. Your cosmetic dentist in Calimesa will be happy to talk with you about your options. Maybe you can start the upcoming new year with a new smile! Professional teeth whitening. Parker offers take-home whitening kits that can produce dramatic results in just a couple of weeks. If you’re careful to follow your dentist’s instructions, your new dazzle could last for years! Porcelain veneers. In as few as two visits to your dentist, you could undergo a complete smile makeover. Veneers are thin pieces of porcelain that get permanently attached to the front of your teeth. They can disguise a wide range of cosmetic flaws. Direct bonding. This process uses a tooth-colored resin to change the shape of teeth, cover discoloration, or repair chips. Crown lengthening. Do you have a “gummy smile”? Your dentist may be able to reshape your gum tissue so your smile has more attractive proportions. Some cosmetic dentistry procedures are simple and straightforward, whereas others require multiple visits to the dentist and some patience on your part. Regardless of which treatment you choose, be sure to stay in touch with your dentist about any concerns you might have. For example, if you are whitening your teeth and notice that you’re experiencing increased sensitivity, don’t be afraid to talk to a professional about it. You should also understand your payment options. Dental insurance does not cover cosmetic procedures, so you may have to use credit or ask if your dentist offers an installment plan that allows you to pay over time. Most cosmetic procedures require some maintenance. With whitening, for example, you may occasionally have to do some touch-ups, and you might have to cut back on certain staining foods. 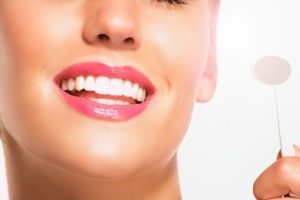 If you have porcelain veneers, you may have to switch to a non-abrasive toothpaste and avoid hard or dark-colored foods that might dull or damage your new dazzle. Do want to feel brand new in the new year? Your cosmetic dentist near Yucaipa can help you achieve the smile of your dreams! Dr. Scott Parker is a native of the Yucaipa area who is passionate about dental care. He takes pride in caring for and shaping smiles that shine like the SoCal sunshine. If you have questions about any cosmetic dentistry procedure, you can contact our office at 909-795-6019. Comments Off on Ready for a Smile Makeover? Your Cosmetic Dentist Can Help!